Yo-Kai Watch review 0 out of 5 based on 0 ratings. 0 user reviews. As a child, I used to believe that there was more to the world than meets the eye. Not fairies, of course. Nothing so diaphanous or innocent. Growing up in Malaysia, my imagination swarmed with hungry ghosts and pontianaks, and all the other things that go bump in the Southeast Asian night. Yo-Kai Watch reminds me of those days – except this alleged Pokmon challenger’s a lot less toothy. The basic premise of Level-5’s popular role-playing game is this: you play as either a boy or a girl who discovers an unusual device beside a sacred tree. You pick it up and your life changes. Unlike other humans, you’re now able to bear witness to the strange world of the Yo-Kai, the unseen spirits who permeate every corner of the known universe. It’s a glorious spectacle. The Yo-Kai feel wonderfully integrated into the environments, and I won’t lie, it’s an absolute joy to see how they interact with an oblivious humanity, alternatively helping and hindering, never outright malevolent, but always delightfully mischievous. There’s an undertone of darkness that works in the game’s favor. Although it never gets particularly graphic, you see nods towards mythological inspirations. Jibanyan, for example, is a red cat spirit who is adorable and effusive and every inch the ideal mascot, but also the tragic consequence of a traffic accident. And speaking of actually acquiring a new buddy, here’s how it works. Very often, you’ll find yourself using the sensor built into your Yo-Kai Watch, which will alert you when a prospective companion is in the vicinity. From there, you’ll be asked to scope out a still image until you’ve located the hidden Yo-Kai, at which point you’ll jump into battle. But it’s not just a contest of arms. Sure, you’ll need to beat the Yo-Kai in battle. But you’ll also have to convince them that you’re worthy of friendship – a task that often requires chucking them food. So much more wholesome than cramming them into a ball, no? This gentleness pervades a lot of the game, and that makes sense. 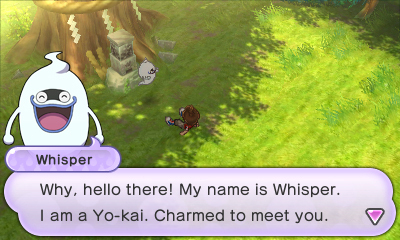 Yo-Kai Watch is a game for children – a game that actually acknowledges that the protagonist is a child. Unlike Pokmon, for example, in which you’re ostensibly a prepubescent, but one who is allowed to roam without the constraints of a bedtime, to engage in violence by proxy, to combat villainy directly rather than simply calling the police. And there’s nothing wrong with that. If we held the medium to the standards of reality, we’d only ever have Truck Simulator to play, and what a strange world that would be. Still, it’s fascinating to see how Yo-Kai Watch draws from the mundane. Most of the quests that you encounter are rooted in the everyday: arguments between friends, spats between parents, schoolyard lassitude, hunger pangs. All things that an ordinary kid can do, all things that they should do if they’re looking to earn approval. Conceptually speaking, it’s slightly twee, especially if you take into account the kind of stories we traditionally tell in Western media, where the rebel is idolised and the status quo is there to be broken. Yo-kai Watch isn’t like that. Not remotely. Heck, it even wants you to abide by traffic laws. Having said all that, though, this is also where Yo-kai Watch falters, a victim of its own aesthetic. It plays exactly like you’d expect, like it was specifically built with kids in mind as opposed to adults on a nostalgia bender. As such, the combat, while not bad, is simple. Not terrible, not underwhelming. Just simple. To break it down slightly further, battles in Yo-Kai Watch work something like this. When you encounter an enemy, the game switches to the battle screen. Here, you’ll have tenuous command of six Yo-Kai, all of whom are represented on a wheel in your bottom screen. Unlike with Pokmon, combat happens independent of your involvement. The Yo-Kai will trade blows until one party collapses in its entirety. However, you can intervene in multiple ways. Firstly, you can decide which of your Yo-Kai will function as the active three by spinning the wheel. This, of course, lets you optimise the available line-up and take advantage of any passive benefits that might arise from connecting combatants of the same so-called tribe. There’s also a more active component. As your Yo-Kai fight, they’ll build up their “soul” meters. Once a soul meter becomes full, you’ll be able to unleash the character’s “Soultimate”, which is either a meatier attack or a status ailment, by succeeding at a simple micro-game. The whole thing works surprisingly well and boss battles can be a frenetic mess, what with having to actively reposition targets on weak spots, keeping Yo-Kai functional, and unleashing Soultimates in a timely fashion. The problem is that the action gets repetitive. There are only so many micro-games, so many times you can do the same thing before it begins to grow tiresome. I imagine this wouldn’t be a problem for the average eight-year-old, who might be too enamored of the colorful effects to notice the samey-ness that pervades the combat, but adults should be forewarned. Despite all of its problems, I love Yo-Kai Watch. It’s kind and it’s domestic and it champions some delightful values. I can’t actually play it for longer than short bursts at a time but when I can, it’s a joy. I’ve heard rumblings that the newer iterations are more intricate, providing more content for the discerning, so it might be worth looking at Yo-Kai Watch as a wobbly introduction to a fresh new franchise.